Our Reflective Horse Leg Wraps are made extraordinary durable and contain reflective material which makes these leg wraps ideal for night riding with your horse. These are one of our most popular products and protect your horse during night riding. 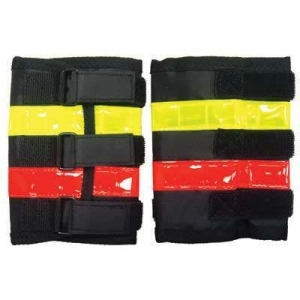 This Reflective Leg Wrap features two colors bands on nylon with three double over hook and loop closures. These leg wraps have an extraordinary feel, yet are easy to work with and provide maximum comfort for your horse. You can see the reflective red and yellow stripes in the picture shown above.